Yes, I'm still posting on the Iwo Jima Reunion. I'm behind thanks to my paying day job. Pictured above is Norman Hatch, a combat Cameraman for the United States Marine Corps during WW2. I had the pleasure of interviewing him. The primary job of combat camera was to capture Marines doing what Marines do in order to make training films. Basically, they were taking the 'game' film that would be analyzed by military leadership to figure out what they did correctly and what could be improved upon for the next battle. In addition to creating training films, the footage was edited and distributed to news organizations where it ended up on those news reels that played before the movies. In our current information overloaded society, it is hard to imagine a time where people only got their news from news papers, radio and the news reels at the town theater. ou may notice while watching the clips below that often times, the camera man is standing while he's filming. How the heck did they not get shot? Norm responded that he thought camera men survived because the Japanese may have thought the cameramen were crazy and therefore, killing a crazy man on the battlefield would have been bad luck. Hatch then went on to land on Iwo Jima as a motion picture cameraman with 90 other combat journalists where film shot by the pool was edited into another short documentary and released in April 1945, just a month after the battle. This documentary was nominated for an Academy award but did not get the nod. Believe it or not, Marine Corps and Navy combat camera only lost two men on Iwo Jima. Combat cameramen in World War 2 operated a bit differently than they do today. Today, Marine combat cameramen are riflemen first, they carry standard weapons in addition to their cameras. At the beginning of WW2, combat cameramen didn't carry any weapons. Norm Hatch requested that cameramen be permitted to at least carry a pistol. I have been told by docents at the Museum, that a General told Hatch combat camera could not carry weapons because their job was not to fight but to film. Besides, having a cameraman present made the Marine's fight harder (gotta look good in the news reel for the folks back home). Hatch did say that cameramen were permitted to carry a pistol. They couldn't carry a rifle because having it slung over their shoulders would have gotten in the way and prevented them from doing their job correctly. For the battle for Iwo Jima, the Marine Corps had 30 combat cameramen assigned to each Division. These included both still and motion picture cameramen. Three Marine Corps Divisions were committed to taking Iwo Jima. Doing the math, there were 90 combat cameraman. Seems like a lot of camera coverage for an island that is only 5 miles long and 2 miles wide. Consider this, there were 20,000 Japanese soldiers dug in and the US landed with some 70,000 Marines, Navy Corpsmen and Seabees. The photographers were assigned to each unit and they were part of their units during training on Hawaii. 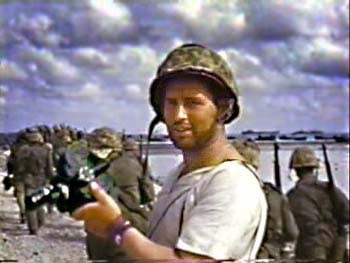 On Iwo Jima, motion picture photographers shot in color and in black and white. the B&W film could be tinted back at the studios. In order to get the film and written correspondence off the beach in a timely manner, there was a landing craft dedicated to the press. It came ashore several times aday to collect items and return them to the ships. From the ships, a PBY or PBM aircraft would fly everything out to Saipan where the Navy would edit and develop the items and then send them to the United States. All combat cameramen were to return to the ships every 2 days to turn in film, have their cameras serviced and check-in so it could be confirmed they were still alive. This was how Bob Campbell, Bill Genaust and Joe Rosenthal got sent to cover the raising of the replacement flag on Mt. Suribachi. Since the film was sent out for processing, no one on the island, including the photographers had seen any of the flag raising photos. Rosenthall's photo had been shot in horizontal on 4-inch (medium format) film. The actual frame was unremarkable, according to Hatch, because it had a lot of 'noise'. The actual flag raising was a little portion of the image, right in the middle of the frame, to the left you could see the beach with all of the landing craft, you could see the top of the mountain with all of the debris, and to the right, you could see blurry ships surrounding the island. A photo editor back on Saipan cropped the photo, getting rid of all the 'noise' and focusing on the flag raising. Hatch said that while Rosenthal took the picture, it was this unnamed photo editor that made it into the iconic image that it is. Almost immediately there was controversy back in the states over this photo. When Hatch returned to the US to deliver motion picture film to the War Department, he got summoned to the Commandant's office. He was the first person to return to the states from the battle, which was still raging. Without a shower or a change of clothes, Hatch arrived in the General's office were representatives from Time and the Associated Press were waiting. They wanted to Hatch to confirm whether or not the photo had been posed. Hatch hadn't even seen the photo yet. However, he knew Genaust and Campbell had also been present and they had taken motion pictures as well as still photos. In fact, Campbell had taken photos from an angle that allowed him to capture the lowering of the first flag and the raising of the second, together. Hatch had no doubts that the Rosenthal photo was un staged and spontaneous, because he had two other photographers photos to prove it. It is amazing that even with all the photographic evidence that there continues to be so much controversy 63 years later. Controversy that gets fed by inconsistencies with the stories the veterans themselves are telling. But, more on that when I take a look at a new book coming out this spring. I'll look for you next time we come to the Museum. Thanks for the info on Norm Hatch. I am however surprised that you did not comment on who the two photographers that were killed on Iwo were - Since one of them had to be Bill Genaust, the motion picture cameraman who filmed the flag raising shile standing next to Rosenthal. Do you know who the other was? Also, it looks like the Japanese will not be allowing any more reunions on the island. I was just there a couple of weeks ago and got that news - seems it has all gotten a bit too comercialized for the Japanese Self Defense Force.